The painting will be finished tonight! It's oil on gesso board foiled in rose gold leaf. 18"x24"
The source image I'm working from is on the right. It's a shot I took of Poppy Liu in our photoshot. Isn't she radiant? The painting will be finished tonight! It's oil on gesso board foiled in rose gold leaf. 18"x 24"
This is the source image I'm working from. It's a shot I took of Poppy Liu in our photoshot. Isn't she radiant? Admission to an intimate meet and greet with the artist from 7pm to 8pm and general admission to the party. Complimentary cocktails by Vodka Mariette and hors d'oeuvres will be served. Includes five free raffle tickets. Admission to the event from 8pm to 10pm. Includes one complimentary glass of champagne and one free raffle ticket to win an original Ginger Del Rey painting. The lovely Rosie Cheeks, one of the most sought after burlesque dancers in NYC and a fantastically talented gal, will be body-painted by Ginger Del Rey to be the living embodiment of her painting "Mercurial Angel". Rosie is a classically trained dancer and has also studied at the New York School of Burlesque. You can find her performing at Dances of Vice parties (she's a fan favorite) and at the fancier burlesque establishments throughout NYC. Check out her facebook page to see what she's up to this month. The flame-haired vixen Bettina May will enchant and entice you as the living embodiment of Ginger Del Rey's painting "Firewalker". Bettina May has been a pin-up model and burlesque performer since 2003, starting her career as a model for SuicideGirls.com. She was featured on an HBO special on the rebirth of Modern Pin-up shortly thereafter, which introduced her to an international audience. Since then she has performed internationally on stages in Paris, London, Berlin, Rome and more, as well as touring nationally constantly for the past 6 years. She is also a much sought-after pin-up photographer and vintage stylist, putting her love of vintage style to good use as a consultant for period films and running her successful pin-up makeover classes, which she styles and shoots herself. 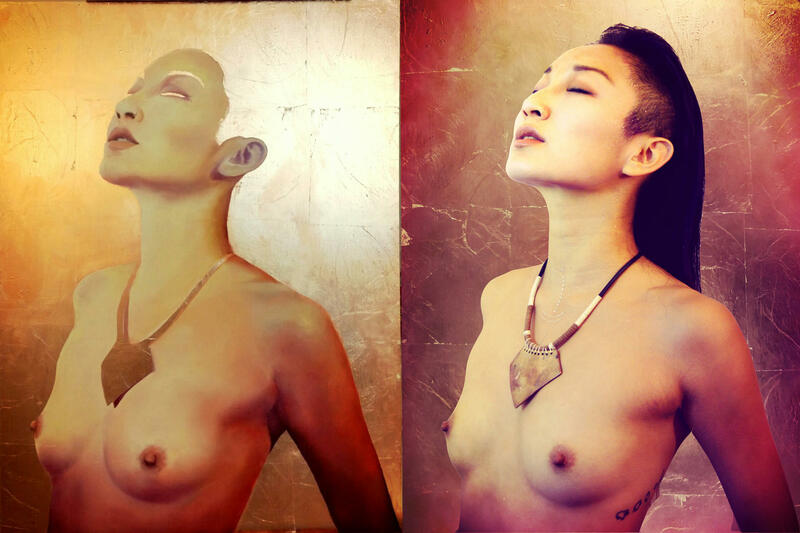 The infectiously ebullient Poppy Liu will dress you up in fantastic attire in our own Goddess Photobooth Room! I am an artist and I am an activist. The two are inseparable in my mind. We, the makers of worlds, the writers of stories, the creators of communities, the people who have made it our life's work to be fearless and fierce imaginers, the people who spill over the edges of where our bodies try and contain us, we create and we make because it is the only way we know how to exist. For us, there is only creation and destruction – nothing in between. So in defiance against destruction, in defiance against death, we create to stay alive. We're proud to have delicious Vodka Mariette as our sponser for the VIP Cocktail Hour featuring our signature drink, the Ginger Mangotini. "A goddess is a woman breaks the mold. She's who she wants to be...and she offers no apologies."